If you’re installing new gardens or updating your landscape, you’ll want to consider including native plants in the design. Because they are naturally inclined to grow in the local climate and soil conditions, native plants tend to grow beautiful and healthy with a lot less work. That means less watering, fertilization, and regular maintenance than is required of your more exotic plantings—which can still be sprinkled into the design to ensure a unique look. At O’Grady’s Landscape, we have helped many of your neighbors throughout Northern Virginia with planting projects since we opened our doors in 1991. Our skilled landscapers can help you select the best mix of native plants for your outdoor space and expertly install them so that they receive optimal sunlight and rainfall. We serve homeowners in the City of Falls Church, North Arlington, Great Falls, McLean, and Vienna. Contact us to request a consultation today! Beautiful and able to attract equally beautiful wildlife—think butterflies and hummingbirds! 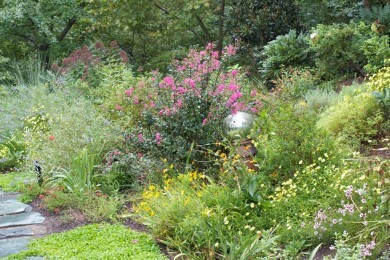 There are many options for native Northern Virginia plants. In a post we wrote about creating seasonal color, we discussed trees like River Birch and Black Gum, shrubs like Virginia Willow and Sweetspire, and perennials like White Wood Aster, Wild Stonecrop, and geraniums. But these are just a few of a wide range of plants native to the region. We can offer more customized suggestions based on an assessment of your property and a discussion of your goals and aesthetic preferences. At O’Grady’s Landscape, we recommend native plants to all our customers as the optimal choice for long-term health. We can offer suggestions on a mix of colors, textures, and species to help you create gorgeous, colorful garden and flower bed designs that perfectly complement your home and landscape. We can also advise on the best installation location for ongoing growth before expertly installing new new native plantings for you, on time and on budget. To speak with us about installing native plants in the City of Falls Church, North Arlington, McLean, Vienna, or Great Falls, give us a call at (703) 533-5001 or contact us online.